I encourage you to travel through the links on this page to learn or refresh things related to discovering market problems, working out possible solutions, rapid prototypes design, and testing with the real people. Why The Design Sprint worth doing? This pretty much depends on the company you're working in. It's recommended to have the following profiles on board for a Design Sprint. The ideal sprint team is between four and eight people, but you can get by with more or fewer than that. Before you can start - you'll need to set the stage: go through a shopping list, book a "war" room, pick a big fight and gather the right people. More on the last two. Design sprint will consume 5 work days for (nearly) all the participants. Investing this much effort you want to receive a great outcome. This means that the problem that you will pick for a design sprint should be really important to your business. The success of your design sprint depends on the people that will participate in it. The list of recommended roles to be included into a design sprint is above. Besides those profiles, you'll need a facilitator (if you're not one of them). The facilitator will be guiding the team through the design sprint, will guard the process and will motivate all participants to put their best shift in. For those of you who work in big companies - make sure participants of your design sprint have the genuine interest in the problem you'll be trying to solve. People who couldn't care less are the worst enemies of a design sprint. Also before day one you need to invite people for the interviews on the day 5. Yes, even before starting the sprint people should be invited. Having this commitment in front of your design sprint team would motivate everyone to complete the sprint and present to interviewees something worth their time. People you invite should represent the target group that has a problem you're trying to solve with a Design Sprint. On the first day of a design sprint, you'll need to "unpack" the problem. You will need to bring to the table all the information design sprint participants have. Everything they know about the problem you all are trying to tackle needs to be presented. All important elements need to be captured in notes. On a second day, knowing the problem, you will produce first sketches for the possible solutions. You would use techniques such as notes, mind maps, "crazy 8s" and storyboard to capture possible solutions. On Wednesday, having a couple or more possible solutions, you'll need to decide which one are the best. Ideally, you'll choose one, best one, storyboard it and have it ready for the next step. If you can't pick one - you'll choose few for the "battle royal". The fourth day is a prototype day. But it does not mean that entire team just standing on the shoulders of one poor designer and looks how he creates a prototype. There are several ways in which every participant of a design sprint can contribute to the prototype creation. Friday is a "D-day". The day of the test. The day when you prototype will be shown to real people. The day when all your ideas will be questioned. The fifth day is for listening. It is for learning. Make sure your entire design sprint team observes customer interviews, take notes to share them at the debrief at the end of the day. Remember that there is no failure in a design sprint. Even if your prototype been trashed by customers - you still won, you won all that time you'd spent otherwise, building the real thing without having this knowledge. 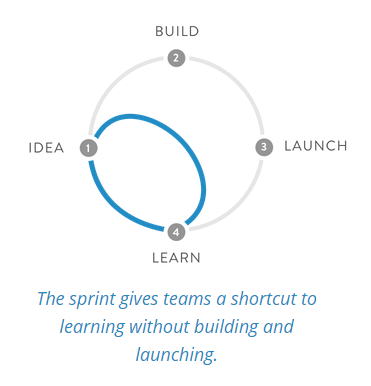 The Design Sprint is a great way to learn, to solve complicated business problems without huge investments. Making regular design sprints will lead to a better product delivered to the market faster.